Consoles: Windows PC (Reviewed), Mac – System Requirements are linked here. Four LEGO Minifigure friends are on an adventure to find true Imagination, the stuff LEGO builders use to create their amazing creations. After finally finding it, however, one of them turns traitor. He tries to turn imagination into chaos and is swallowed up by Imagination. This turns the world dark and it is only by fighting back that the Minifigures can once again claim their destiny. Therefore, you are called upon as a Minifigure of the masses to help turn the tide of battle. Combining elements of Transformers and Star Wars, the story in Lego Universe may sound very over the top and something that only 8 year-olds would like. And maybe that is true. After all,who else would imagine that imagination was a powerful rod of blue crackling lighting that could release LEGO spiders and puppies? But this is a game marketed at that age group, so make sure to find your inner kid before you play it. We all know it is in there. If you are positively sure that it has been squelched, the most amazing title trailer will surely help you along. Seriously, the slow motion antics of LEGO figures quick building a racing car are insane. Even if you are not interested in the game, you should really check out the trailer. It is epic. One neat part about the story is that you can choose a faction. Each faction has decided on a different way to defeat the Maelstrom. The Assembly relies on building. The Sentinels chose battle. The Venture League explores. A fourth faction, the Paradox, researches the Maelstrom. Choose carefully and receive different options based on your choice. All in all, the story may not be the most emotional ride out there, but for a family/kids game, this is perfectly fine. If you have played previous LEGO Games like LEGO Indiana Jones or LEGO Star Wars, you will be right at home in this universe. Of course, this game offer much much more customization options, unlockables, quests and places to explore. 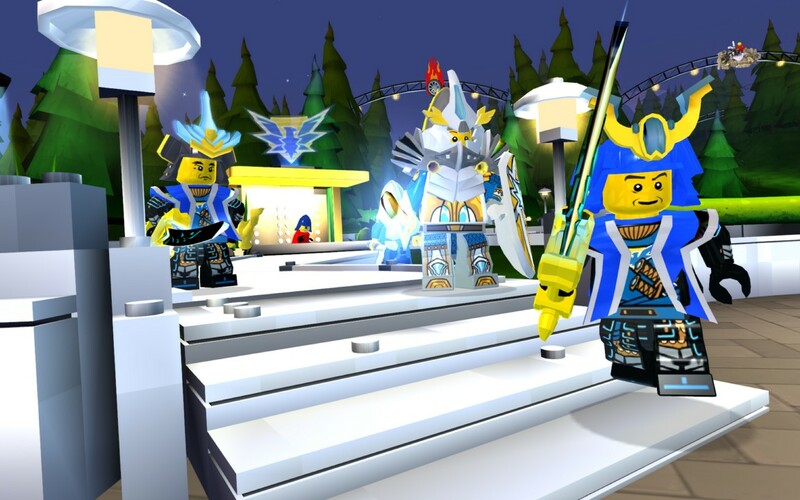 As stated, LEGO Universe is very similar to past games in the franchise. You will quick build some stuff, solve puzzles and kill bad dudes the only way that a Minifigure can: WITH LEGO WEAPONS! That brings up the most important feature in the game. That feature is customization. Like any good role playing game or MMO, LEGO Universe starts the player out with a very limited wardrobe and weapon set. In fact, you only start with your fists as weapons. But, the deeper the game gets, the options are only limited to your imagination (and to what NetDevil or LEGO have produced.) These options are tremendous though. Mix and match between Knight, Pirate or modern day costumes, plus many more. There may even be licensed stuff coming, as the LEGO Universe is always expanding. If the options for clothing your Minifigure are not enough though, then get ready to claim your own property without even a mortgage! Once you clear off some unimaginative Maelstrom Minfigs (the evil minions) from your land, you can start building your own creations using bricks you have found or bought. If you always wanted unlimited Lego blocks, this is your game. That is worth the cost of admission itself. Speaking of which, this game will set your wallet back $30.00 from many online retailers, a savings of $20 – $30 off most games. I have heard many complain that the game is short for an MMO, but the developer is adding new areas, and more options all the time. It is disheartening to realize that to play the game online, you have to have pay around $10 a month in subscription fees. And if you cancel, you apparently lose all your previous building projects. That is a little bit of steep price to pay in my opinion, but it is till a very fun game to play and it is worth the money. The only other niggling problem I have with the game is the platforming. It seemed as though I was constantly falling and having to go through the same motions to get where I was before. This was never frustrating enough to make me quit, but it was tedious. I would like to say that LEGO Universe adds a nice gameplay element in the area of quick building. In this game, you must collect Imagination spheres in order to be able to quick build. Occasionally, this as aggravating as I wanted to merely get on with the puzzle. Overall though, this adds some stabilization, foundation, strategy and difficulty, which is a much needed addition. In earlier LEGO games, I always felt like something was missing whenever I could just so easily build something. Graphics in the game could use some work, but they also allowed my pile of junk PC to run the game. A fair trade off for me, I would say. Not to mention the fact that you will be too busy solving creative puzzles, completing fun quests, laughing at zany humor and disassembling LEGO people to even notice the graphics. The game also has some majestic coloring & design schemes, so watch out for those. The soundtrack in the game is not half bad. Sure, I may have switched to some of my own music after listening to it for awhile, but you won’t be turned off by it and I never really got bored with it. I did notice some audio sync issues, but nothing to distract from the overall quality of the game. LEGO Universe holds to the standards set regarding voice acting, which means that we still have no idea what an actual Minifig sounds like. But they do have speech bubbles. In addition they have their standard mumbling language. But that quickly got on my nerves, as the sounds they make are much more high pitched and whiny than in other games of the franchise. Luckily, they don’t make sounds too much. 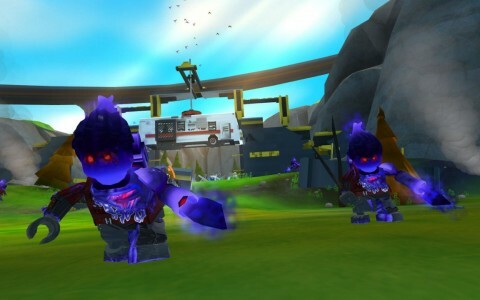 LEGO Universe has a silly story that is full of wacky characters and short on real plot. It may be a tad expensive as well. But the amazing and classic gameplay is great. The LEGO license is well used and perfectly fitted to an MMO space. In conclusion, you know that ultimate LEGO set you always wanted as a kid? It had every special piece and all the right blocks. You knew you would never get it and you would continue playing with the hand me down ones that had the chewed up pieces. Imagine getting that set, reaching in, & finding that perfect piece on the first try and then completing your awesome rocket. 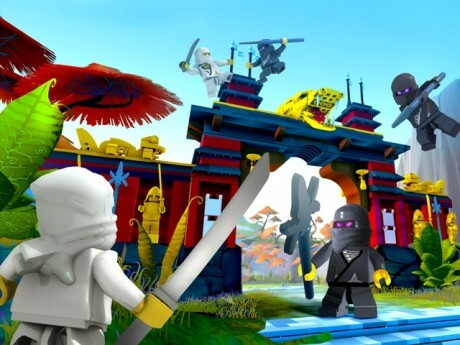 LEGO Universe will give you the same experience and more. Personal Note: After the review, I looked up NetDevil Studios and found out they were based in my home state of Colorado. So, here is a shout out to them!